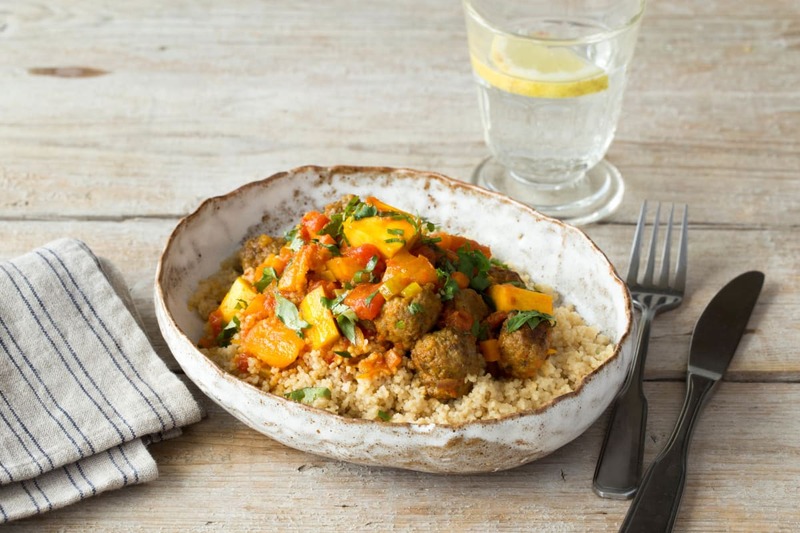 Moroccan food has been heavily influenced by Berber, Moorish and Arab countries over the centuries and is alive with interesting flavours, textures and fragrance. For the linguists amongst us, we’ve used a mixture of kamoun (cumin), kizbra (coriander) and 7ab el hel (cardamon), combining it with Morocco’s national delicacy, couscous, to transport your taste buds to the Middle East. To get dinner on the table super quick, we recommend getting one person to tackle the meatballs whilst another looks after the sauce! Peel and chop the carrot, garlic and half the onion as finely as possible. Finely chop the celery. Tip: Whizz in a food processor if you have one. Peel and roughly chop the parsnip into 2cm cubes. Finely chop the spring onions and roughly chop the apricots. Heat 1 tbsp of oil in a non-stick frying pan on medium-low heat. 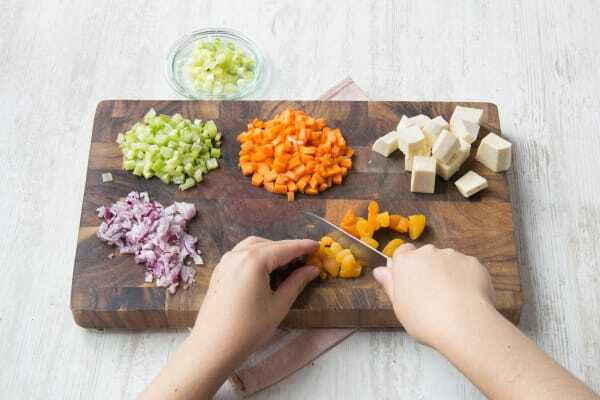 Cook the finely diced carrot, garlic, onion, celery and the parsnip for about 8 mins. Tip: You want to cook the mixture until it is soft and be sure not to let it brown off. Sprinkle on a ¼ tsp of salt and half the Kabsa spice. Add the chopped apricots, give everything a quick stir and put a lid on the stew for 5 mins. 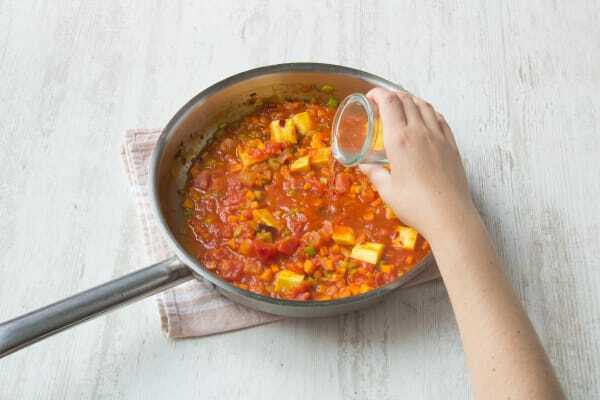 When the vegetables have softened add the chopped tomatoes and 200ml of water. Tip: If your stew is drying out a little, turn the heat to low and add a dash of water. For the meatballs, thoroughly mix the spring onions into the lamb mince. Mix in 1/4 tsp of salt, 1/4 tsp of ground black pepper and the remaining Kabsa spice. Take 1 tsp of the lamb mixture at a time and roll it into a little ball. 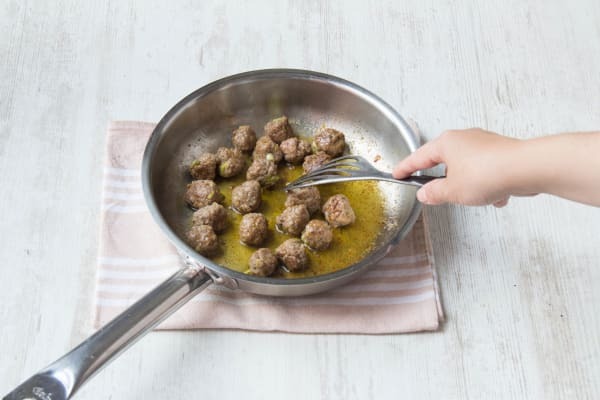 Tip: Keep a cup of water to clean your fingers while you make the meatballs. Tip: You want to keep the meatballs small, so we recommend a helper to speed up the process. Heat 1 tbsp of oil in a non-stick frying pan on medium-high heat. Cook the meatballs for a couple of mins on each side until they are browned off. When the meatballs are browned off, drain the oil and rest them on kitchen towel. In a pot, add 250ml of boiling water together with half the stock pot. Add in your couscous and cover the pot with a lid. Take off the heat and leave to rest for 5 mins. Tip: Be exact with the amount of water to prevent soggy couscous! Roughly chop the coriander. Fluff up your couscous with a fork. Stir the meatballs gently into the stew. Serve the stew on top of the couscous with a sprinkle of coriander.